Anyhow, since the API here was asking visitors to login to Twitter, I decided the best thing to do was remove it from the sidebar. Sorry if that caught anyone out. Now, to the business at hand. I have actually finished a project! 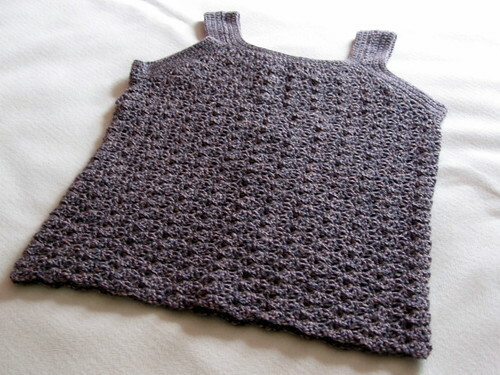 This is Sweet Tea, a tanktop (or vest as the designer calls it) from Doris Chan's Everyday Crochet. I made it in a wool mix DK called Life DK from Stylecraft, the colour is Nutmeg Marl which worked up darker and more grey than I thought it would, but I like it. It's sombre and sensible and although I've never been much of a tanktop wearer, I'm hoping that I can persuade myself to wear it as office wear once autumn hits (rather than the wet, warm and humid summer we're currently enjoying). Being a tight crocheter, I had trouble hitting gauge, so I ended up working on the smallest size (32 inches across the chest) but on the next hook size up, so going from 4.5cm to 5cm for the main piece. I worked the straps with a 4mm hook as specified in the pattern. Miraculously, however, once washed and dried and measured lying flat, this top came out at 39cm across the chest, so that's going to be a little under (as in maybe 1 cm) 32 inches all round. So maybe I wasn't as far off gauge as I thought I was. 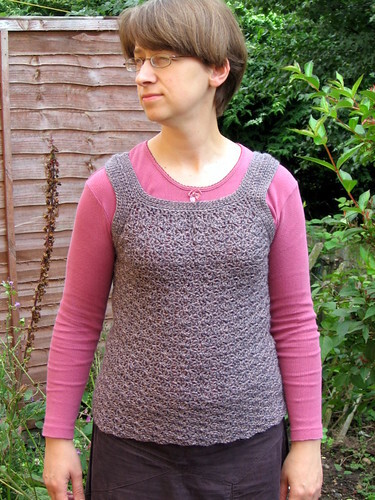 The result is a piece that I'm hoping has just enough negative ease to be flattering, but can be worn over t-shirts or an office blouse as a suitable layer. It certainly seemed to fit when I tried it on! I did have a few problems getting started on this one as I had difficulties understanding the pattern. Not to say it wasn't well written, but I had problems getting my head around the designer's approach to and style of writing. 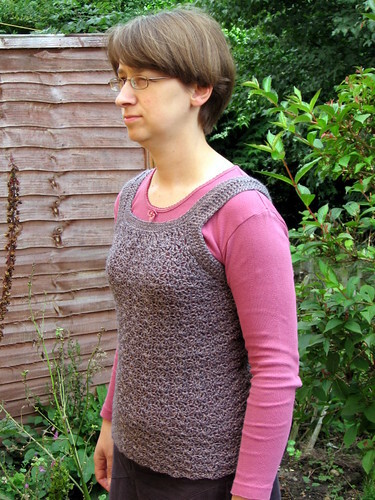 Fortunately, there is a group on Ravelry where this top has been discussed extensively and I found the answers which made things a whole lot clearer. The pattern wasn't wrong, I just wasn't reading it right! Oh and much kudos to Doris Chan, she was right in there with the crocheters working from her book, giving support, answering questions and clarifying any points that weren't as clear as they could have been in the pattern. I've seen some designers be very snooty to people stuck on their patterns, but not this lady, she was very helpful. I made a couple of modifications, besides changing the hook size. 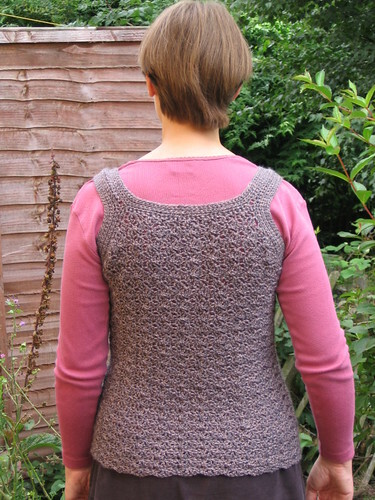 This tanktop is crocheted top down, starting with two identical front/back pieces that are joined under the arms, before crocheting in the round to work down the body. After reading comments on the aforementioned Ravelry forum, I decided to attach the straps immediately after joining the front and back, so that I could try the piece on as I worked it. That decision made, I lengthened the straps, crocheting 30 BASE CH/SC (or 30 BASE CH/DC if you're British like me) so that my tighter stitches didn't cut off the circulation to my arms. And finally, I continued the body until I had 33 rows or 41cm from under the arm to hem, before binding off. All in all, once I got over the pattern reading issues and my sudden inability to count which plagued me when I started this project, I liked how it turned out. The crochet worked up very quickly and was fun to make, problems and frequent re-crocheting included. I also learned a lot from this one, followed a crochet pattern all the way through and I'm hoping gained a new staple for my wardrobe. its lovely.. I have never tried crochet but it is on my list of things to attempt at some point! though I don't think i will make anythign as complicated or pretty as that. I'm undecided about public Twitter or not, I don't put anything that interesting and keep changing my mind. Wish I could post about my current projects but as you know I can't due to spies. It looks very nice, I am seriously impressed!